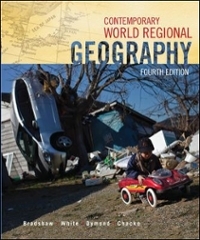 Contemporary World Regional Geography 4 Edition World Regional Geography is an exciting science that encompasses a wealth of information regarding geographical landscapes, cultural traditions, population patterns and economic resources. Contemporary World Regional Geography, 4e provides a current, balanced geographical study of world issues through analysis of ten world regions and the countries in each. The authors integrate the themes of "global connections" and "local voices" and utilize a consistent structure within each chapter. Each chapter is organized to begin with environmental issues of the region followed by historical geography, which lead into the sections on the modern global era. The latter part of each chapter continues to be devoted to subregional subdivisions.